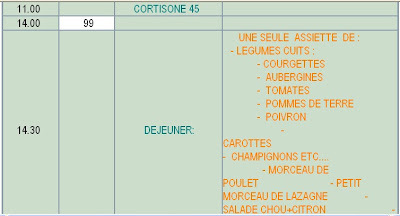 ATTENTION LES PRISES DE CORTISONES DOIVENT ETRE PRISES DE PREFERENCE DURANT LA JOURNEE.IL EST DECONSEILLE DE PRENDRE LE CORTISONE APRES 18H (6HEURE) LE SOIR. DANS CE TABLEAU IL FAUT CHANGER LES PRISES DE MINUIT EN PRISES A 18H. 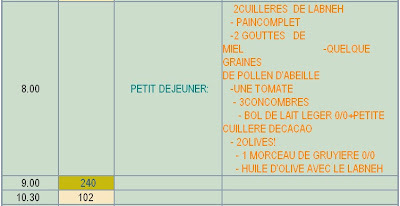 MESURES DETAILLEES D'UNE JOURNEE TYPE DE PRISE DE CORTISONE ET JEU DES TAUX DE GLYCEMIE DANS LE SANG PRIS AVANT ET APRES CHAQUE ACTIVITE DURANT LA JOURNEE. (EXPERIENCE PERSONNELLE). Genial fill someone in on and this enter helped me alot in my college assignement. Thanks you for your information.